Tanzania is one of Africa’s most sought after safari destinations. Here are the best Tanzania safaris. They offer adventure, scenery, culture and much needed relaxation at the white sandy beaches. They are ideal for both first-time and seasoned travellers. If you are seeking big-5 adventure, photo safaris, family safaris or a romantic honeymoon, you will find what you are looking for in these best Tanzania safaris. They can easily be combined with a beach holiday and customised to meet individual requirements. Tanzania’s main safari areas are the northern parks, southern parks and the western parks. The northern parks comprise of the Serengeti National Park, Ngorogoro Crater Conservation Area, Lake Manyara National Park, Tarangire National Park and Arusha National Park. The Serengeti is renowned for the annual wildebeest migration that sees over 2 million wildebeests (gnu), gazelle, eland, topi and zebra trek in a clockwise fashion from the park to Kenya’s Maasi Mara following the rains. Ngorongoro crater is one of the largest intact volcanic calderas in the world and it is full of wildlife. Lake Manyara is famed for its tree climbing lions. Tarangire offers a lot of wildlife, but it’s only seasonally good. Arusha National Park is not in many itineraries mainly because it doesn’t offer the big 5 (lion, elephant, buffalo, rhino and leopard). It’s at the base of Mount Meru and close to Arusha, the town from where the northern parks are explored. The southern parks are Selous Game Reserve, Ruaha National Park and Mikumi National Park. In terms of wildlife densities and ease of viewing, the southern parks aren’t quite on a par with the northern parks. They are thus not many in these best Tanzania safaris. However, they offer a more holistic wilderness experience, as tourist densities are lower and game lodges tend to be more exclusive, catering to a more upmarket clientele. They are often the choice for a second safari on which ticking off the big 5 is less of a concern. Selous Game Reserve is immense and close to Dar-es-Salaam making it popular as an add-on to a beach holiday in Zanzibar. It offers game drives, boat trips and walking safaris. You can easily drive here from Dar-es-Salaam and take in the less impressive Mikumi National Park on the way. Ruaha National Park is very remote and it’s one of Africa’s best kept secrets with excellent game viewing, including many animals that aren’t easily seen in Tanzania’s northern parks, such as wild dogs and several unusual antelope species. The western parks are Gombe National Park, Mahale Mountains National Park and Katavi National Park. Gombe and Mahale are not in these best Tanzania safaris, but a tour can be arranged. The two parks are on the shore of Lake Tanganyika and offer the best chimpanzee tracking in Africa. Getting to Gombe and Mahale is expensive and time-consuming and is mostly done by chartered plane from Arusha. Instead of visiting one of the parks as an add-on to a safari in the north, you can combine it with a safari in Katavi, which is the savannah reserve in the west and probably Tanzania’s least visited park. Not for lack of wildlife, though. This park offers excellent game viewing in the dry season with superb wilderness appeal. Malaria is probably the most important health risk to be aware of when on safari. However, anti-malarial tablets and syrups are available for babies and young children. Complete and up-to-date information about travellers’ health in Tanzania can be found in the following resources: Australia – www.travelclinic.com.au, Canada – www.iamat.org (Vaccinations / Malaria), Ireland – www.tmb.ie, New Zealand – www.iamat.org (Vaccinations / Malaria), United Kingdom – www.fitfortravel.scot.nhs.uk, United States of America – wwwnc.cdc.gov/travel. These best Tanzania safari tours can be easily combine with a beach holiday in the island of Zanzibar. Activities here include relaxing in gorgeous beaches, soaking up Swahili culture and numerous watersports including windsurfing, snorkelling and kitesurfing. Other less popular, but good, alternatives are Pemba Island, Mafia Island or Pangani. Some of these best Tanzania safaris include a safari in Kenya – offering you the best in East Africa safaris. Popular destinations in Kenya include Amboseli, Lake Nakuru and the Masai Mara. For mountain climbing adventures see Mt Kilimanjaro climbing tours. This popular Tanzania safari takes you to Ngorongoro Crater Conservation Area, Tarangire National Park and Lake Manyara National Park. The short safari offers the choice of lodge or camping. This private safari takes you to Tanzania’s Northern parks namely, Serengeti National Park, Ngorongoro Crater, Lake Manyara National Park, Tarangire National Park and Arusha National Park. The safari offers you the choice of lodge or camping. This safari takes you to popular wildlife parks in Tanzania i.e. 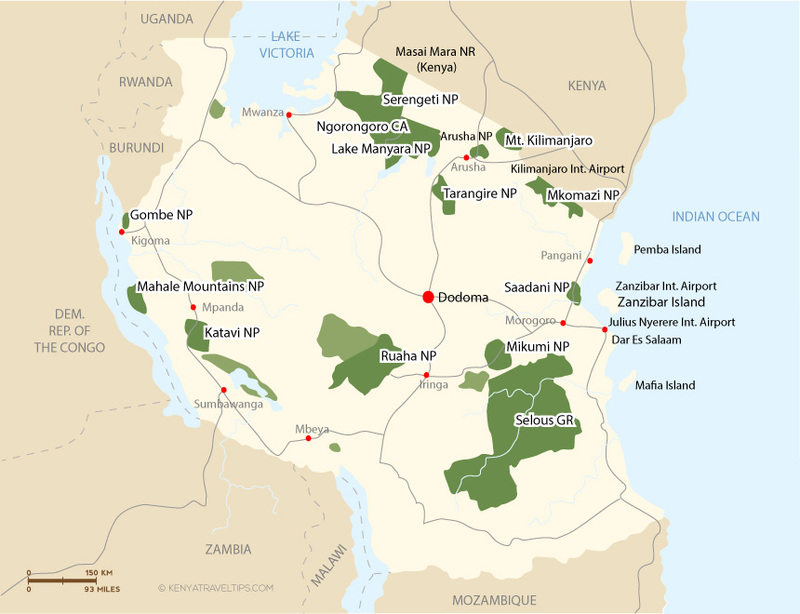 Lake Manyara National Park, Ngorongoro Crater Conservation Area and the Serengeti National Park. Experience Tanzania’s off the beaten path on this game and cultural safari. Encounter the Hadzabe people – the last bushmen in Tanzania, and the Masai people – a pastoral community that inhabit southern Kenya and northern Tanzania. Visit Lake Manyara NP, Ngorongoro Crater and the Serengeti. This family safari offers a wonderful experience. The itinerary gives you game lodges with swimming pools to fill up the time in between game drives and keep the young ones entertained. It is a private safari so you can set your own pace. Visit Arusha NP, Lake Manyara, Ngorongoro Crater, Tarangire and Serengeti. Among the popular family safaris, this private African safari takes you to top wildlife parks in Kenya and Tanzania – Masai Mara (Kenya), Samburu (Kenya), Amboseli (Kenya), Ngorongoro Crater (Tanzania) and Serengeti (Tanzania). The African safari holiday package can be customised to suit your requirements. This private safari offers the options of camping and lodge. It takes you to the top wildlife parks in Tanzania and ends with a relaxing beach holiday in Zanzibar. It is perfect for families and honeymooners. This African safari tour enables you to witness the great wildebeest migration in the Serengeti and visit Lake Manyara, Ngorongoro Crater and Tarangire National Park. This private family safari takes you to top wildlife parks in Kenya and Tanzania – Samburu NR (Kenya), Masai Mara NR (Kenya), Lake Manyara NP (Tanzania), Serengeti NP (Tanzania), Ngorongoro Crater (Tanzania) and Tarangire NP (Tanzania). This East African family adventure includes extra family friendly activities. It takes you to Amboseli NP (Kenya), Kilimanjaro NP(Tanzania), Ngorongoro Crater Conservation Area (Tanzania) and Saadani NP (Tanzania). Use the form below to email your safari holiday inquiry. Expect feedback in less than 8 hours if you e-mail within the working hours (9:00 a.m. to 5:00 p.m. EAT) and in less than 24 hours when you e-mail outside of the working hours. These best Tanzania safaris can be customised to meet individual requirements.